Spence: Lamont Peterson Was the Welterweight Willing to Step Up! NEW YORK – The welterweight Errol Spence Jr. really wants to fight sat several feet away from him Saturday. Unfortunately for Spence, he’ll have to wait at least until sometime late in 2018 for a showdown with Keith Thurman. That 147-pound championship unification fight has been delayed due to Thurman’s rehabilitation from elbow surgery. 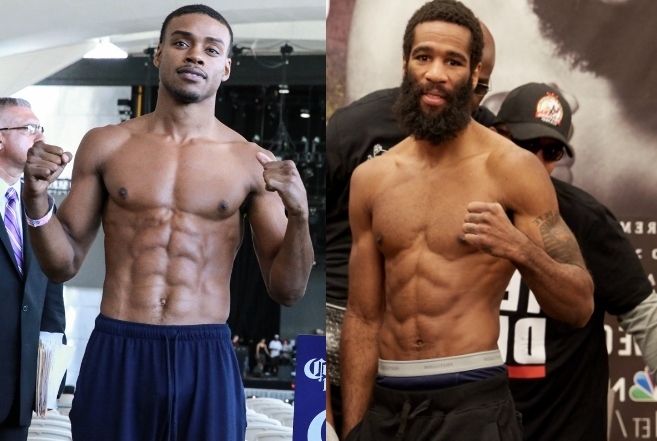 Spence will settle for facing Lamont Peterson in January. The unbeaten IBF welterweight champion confirmed during a press conference Saturday that’ll he’ll defend his title against Peterson in his next fight. Spence-Peterson could take place as soon as January 13 either at Barclays Center in Brooklyn or at a venue on the West Coast. The 27-year-old Spence is very familiar with Peterson and knows better than to take the former two-division champion lightly. “He’s a hell of a fighter,” Spence said. “He’s someone I looked up to in the amateurs. He’s someone I sparred in the amateurs and learned a lot from. I had a training camp with him at the Olympic training center. He gave me different advice – how to punch, how to slow down my punches and how to speed ‘em up. Spence will make the first defense of the IBF 147-pound championship he won by knocking out Kell Brook (36-2, 25 KOs) in the 11th round May 27 in Sheffield, England, Brook’s hometown. Peterson will end a longer layoff than Spence. The Washington, D.C., native hasn’t boxed since he out-pointed Russia’s David Avanesyan to win a 12-round unanimous decision February 18 in Cincinnati. Peterson, 33, has since given up the WBA world welterweight championship he won from Avanesyan (22-2-1, 11 KOs). [QUOTE=Rip Chudd;18142650]How is this his biggest test when he is coming off the Brook win? [/QUOTE] LP is the better boxer & has fought better competition than brook has. brook only beat Porter.